Favourite tourist attractions such as Venice and Easter Island are at risk due to climate change, according to a new study. Prominent scientists and United Nations (UN) bodies have identified 31 cultural and natural World Heritage hotspots which are in danger. They say that soaring temperatures, melting ice caps, prolonged wildfire seasons, longer droughts, rising seas and more erratic weather all pose a threat. Report authors the UN Environment Programme (UNEP), UN heritage group Unesco, and the Union of Concerned Scientists (UCS) warn that governments need to act quickly to stabilise temperature increases. If not, they claim it will be increasingly difficult to safeguard these world treasures. 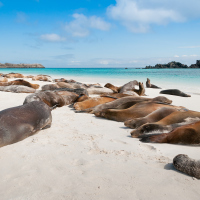 British holidaymakers have to go halfway round the world on once-in-a-lifetime trips to see some World Heritage tourism landmarks, such as the Galapagos Islands. So it pays not to trust to luck, which is where trusted travel insurance comes in. This protects tourists against some of the worst things that can sour a trip, such as lost passports, stolen possessions and mislaid luggage. The UCS's Adam Markham, the study's lead author, says the 31 sites named already face climate change ramifications, with the threat of worse to come if no action is taken.